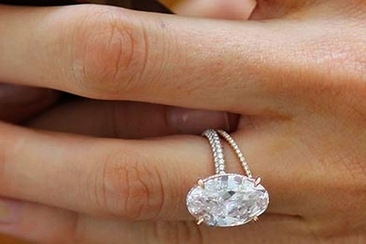 Whenever a big celebrity gets engaged, the first thing everyone wants to know is what does the ring look like? And often they don't get disappointed. But every once in awhile, a celebrity's ring is so impressive, everyone wants to copy it. That is certainly the case with Morgan Stewart. Last year, the Rich Kids of Beverly Hills star's co-star and now-husband, Brendan Fitzpatrick, proposed with a seriously impressive ring! 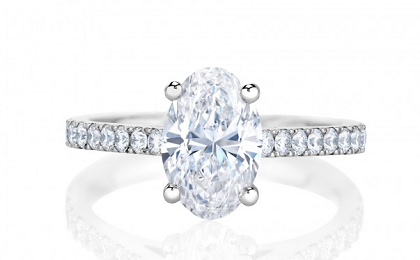 The Jean Dousset Ring is a 4.25 Carat oval-cut diamond on a pavé band. 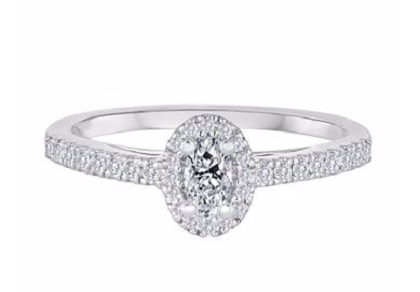 Turn out that oval diamonds on Pavé settings are all the rage right now. And we can help you get the celebrity look, for a much more affordable price. This gorgeous ring differs from Morgan Stewart engagement ring because of the delicate bead-set diamonds surrounding the center diamond. 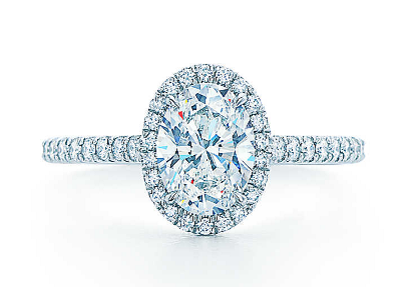 Made by Tiffany & Co., the one carat version of this ring costs $14,100, but different carat sizes are available. It may not be 4.25 carats, but this stunning ring from De Beers definitely has the look. The ring starts at $10,700 for a one carat center diamond. If you're looking for the ring closest to Stewart's, this is a great option. 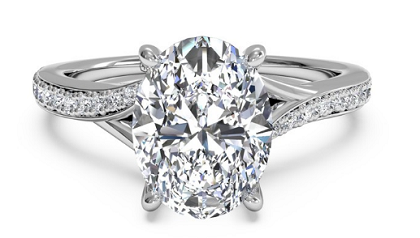 This engagement ring from Tacori has an interesting take on the pavé ring. Only a few small diamonds surround the setting, giving this band a simple elegance. 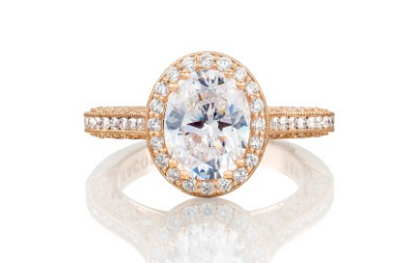 The ring starts at $3,290 (not including the center stone). The ring is a beautiful and unique take on Morgan Stewart engagement ring. This classic diamond engagement ring from Ritani features “V”s of sparkling diamonds surrounding the center stone. 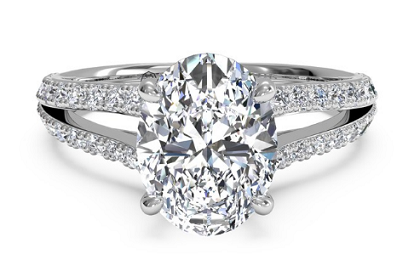 The purpose of the pavé setting is to let in more light, and create additional sparkle. Diamonds are also set into the side of the setting for a unique look. 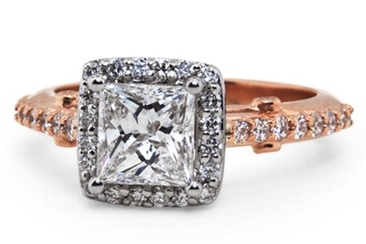 The ring starts at $1,660 (not including the center stone). 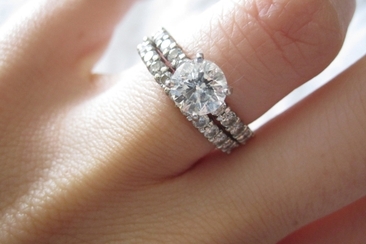 The band will fit oval stones of almost any carat size. This much more affordable ring sells for $1,499. The center stone is only ¼ a carat, but the halo of stones around the diamond gives it the illusion of being much larger. This ring from Helzberg Diamonds allows you to get a similar look to Morgan Stewart engagement ring, without the high price tag. 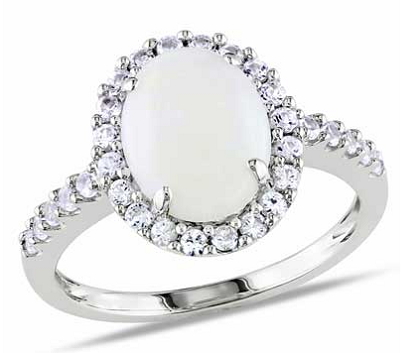 If you're open to something a little different, try this opal ring from Zales. It gives the beautiful look of a large stone, without the heavy price tag of a diamond. The white sapphires give the entire ring a clean and bright look. This ring retails for $389. Ritani's twisted micropavé band gives a unique way to show off the diamonds on the band. You can put almost any size diamond in the setting, so it has a wide range in price. The cost of just the band is $2,140. 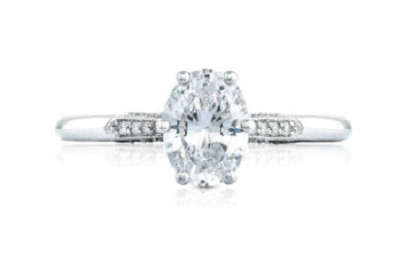 Really show off the diamonds with this ring from Tacori. Available in platinum as well as white, yellow and rose gold, the band offers three rows of diamonds for an opulent look. Pairs perfectly with an oval diamond to complete the perfect look. The band starts at $6,520 (not including the center stone). Another great choice for those who are looking for something a little different in their engagement stone. 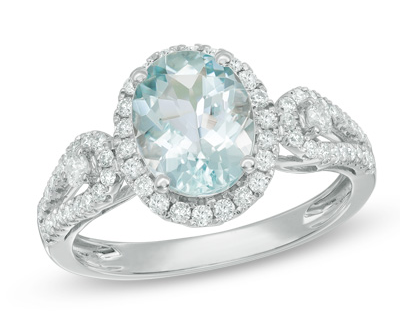 This stunning aquamarine is set in 14K white gold and wrapped in diamonds. Sure to be a showstopper. The ring costs $1,829.99. 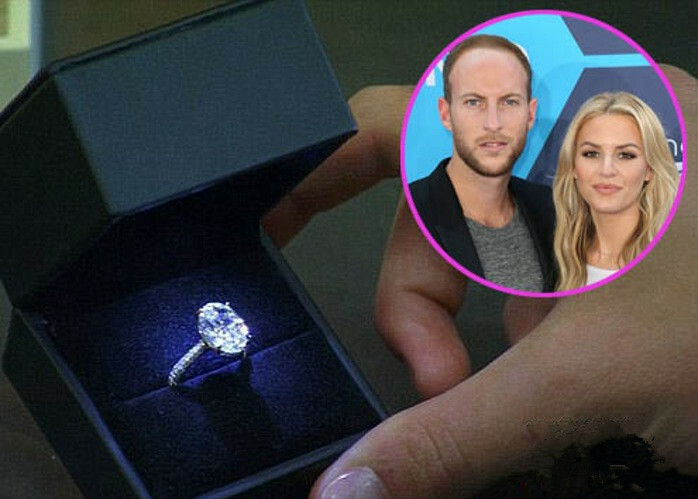 Want the look of Morgan Stewart engagement ring without paying the high price for diamonds? 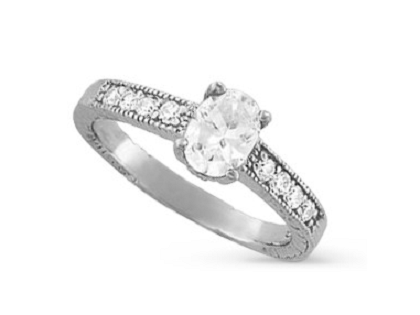 Check out this Charles & Colvard moissanite ring. This ring starts at $799, and you can upgrade it with whatever carat size or metal you'd like. It's a great alternative to diamonds for those who are strapped for cash, or are concerned about the environmental impact of diamond mining. 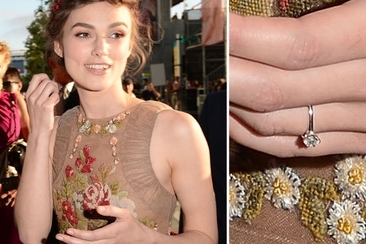 Celebrity engagement rings usually give people the wow. 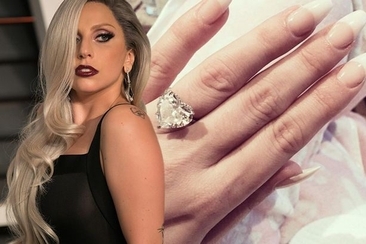 Here we have complied 20 most popular celebrity rings, which are not only stunning, but also full of love. 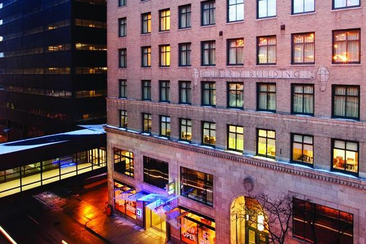 These 15 various wedding reception venues in Des Moines range from low key to extravagant and may just be the perfect setting for your wedding reception.